i love neil diamond! i grew up in a home where neil was played proudly and loudly! so i was THRILLED to see him on american idol this week. it was so fun to see what songs the contestants chose and hear them perform them! david cook rocked it as usual! his song choices were perfect. brooke white was crazy with i'm a believer...i didn't like it all. but, i did enjoy i am i said. jason castro was no good. i felt like just about any person with singing ability could have done what he did last night. david archuleta is getting a little predictable. but, that's not always bad when you are always performing well. i must admit that he does give me chills when he sings. syesha mercardo was on fire last night. i really like both of her performances. my vote tonight is to send jason castro home. yes, he has a cute face. but, he is no where near the star potential as the other three. and he is ULTRA awkward! he must go. it's that time of year again! 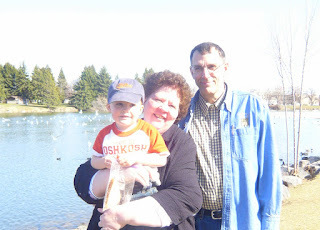 i love that kevin's parents are able to come and see us every spring and again in the fall as they are picking up or dropping off kids for school. 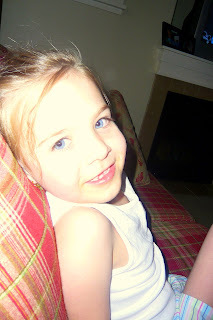 but, now that staci is the only one still in college i am afraid we won't see them as much. 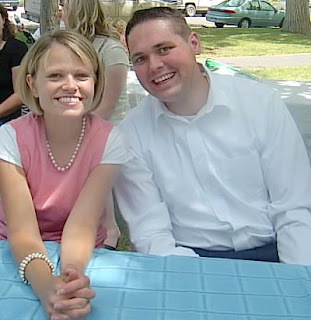 anyway, they flew out here from moline, il last week to attend laura's graduation from byu (GO LAURA!). so, of course they were kind enough to make a stop in idaho falls. 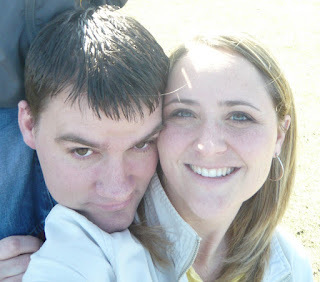 they arrived in idaho falls saturday afternoon and we filled the day with fun. 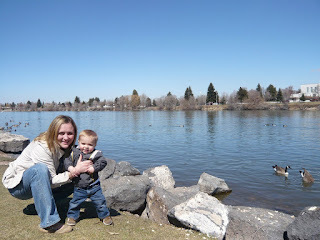 we went to the museum and then to the green belt to feed the ducks, skip rocks, and throw rocks in the water. we wore owen right out! how come the only pictures of me are the ones i have to take of myself. hmmm. 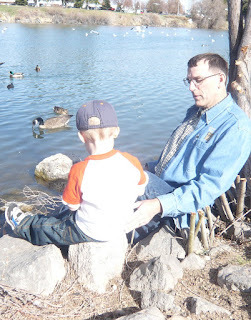 owen loved sitting on the rocks with grandpa...close to the water. 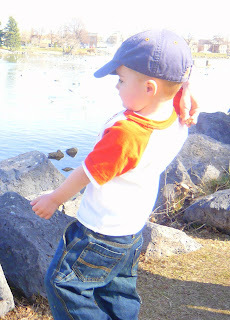 grandpa showed him how to skip rocks and helped him throw bread and rocks into the water. owen loves to throw things in the water. i love how he puts his whole body into it. it was so fun to spend time with kevin's parents. kevin's dad has to get back to work but his mom is going to stay in utah/idaho for the next couple weeks so she can attend kevin's graduation. we look forward to seeing more of her! 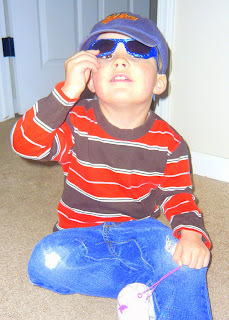 while we were in boise we bought owen a pair of sunglasses. 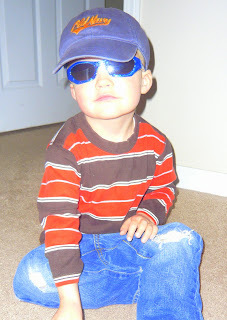 he wears them at night...that is how much he loves them! now we just need the weather to cooperate. 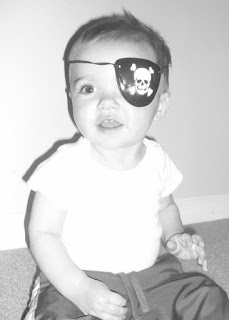 last week wesley discovered owen's pirate eye patch and fell in love with it. he was constantly walking up to me that day and grunting as he held the patch towards me...baby talk for "put it on me!". 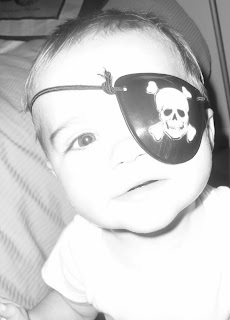 once the eye patch was in place he was off and running. he loved it! today is lisa's birthday (my sister-in-law)! she is turning 26! happy birthday lisa! we hope you have a great day of celebrating. see you next month! 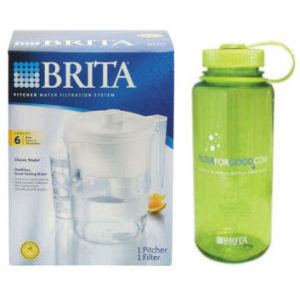 yesterday i went to wal-mart in hopes to find a new brita pitcher (our old brita pitcher of 6 years had seen better days) so i was MORE THAN thrilled to find brita pitchers sitting right at the entrance...ON SALE...with a FREE ($10 value) nalgene water bottle. COOL right!? i guess it's part of a new campaign waterforgood.com to help reduce bottled water waste. so i take it home and show kevin and tell him we can get another free bottle when we buy filter refills. he said..."do it!" then this morning as i was putting my new adorable green water bottle in the dishwasher to clean i thought i would take look at the type of plastic it was made of. why? 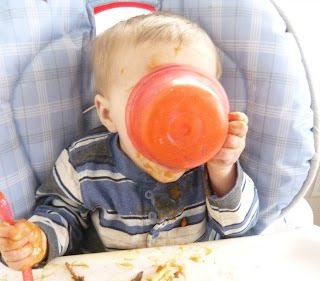 well, not more than a week ago the today show did a special on Bisphenol A (abbreviated BPA) and warned viewers that certain levels of plastic could be toxic because of BPA. and this was still fresh in my mind. so, i flip my bottle over to see the level and to my complete shock it was a level 7! the most toxic kind that should be avoided...at least from what i remembered. so, i am confused. i read somewhere that nalgene is working on getting all level 7 bottles off the shelf in the next few months. so is this part of their clever plan to move them out quickly without wasting them? let's save the world from bottled water waste but at the same time let's put our health at risk? is this a sick joke? am i missing something here? is my adorable green water bottle safe to drink out of. i do remember the contestants on the biggest loser using these same water bottles. so do i use it or lose it? someone educate me! the hairdresser of the family, my sister emily, has set aside two days a month where we can plan on her being available for doing our hair. last night was one of them...and boy was she busy. i think she probably gave seven haircuts! and owen, wesley, and myself were just a few of the recipients. what a great aunt! look how handsome we are! thanks auntie em! if i was a betting woman i would have put money down that jason and brooke would be in the bottom two tonight (this is american idol chat in case i have lost anyone). so i was SHOCKED to see carly and syesha standing there. that is nuts! and then...once i got over the fact that they were in the final two i was SURE that syesha was packing her bags (and i was pretty sure that syesha felt the same way)...so to see carly go! so sad! but, the one good thing was that we didn't have to hear jason sing his song AGAIN. today is a BIG day for kevin! he is in pocatello today where he will present and defend his final project at i.s.u. in front of the physical therapy board. he has put SO much time and effort into this project over the last year and we are SO proud of him. just wanted to let you know kev that we are sending lots of LOVE, GOOD THOUGHTS, and PRAYERS your way today! knock their socks off! i'm "cheering" you on honey! WE LOVE YOU! wesley-the professional food snatcher! if owen ever sets one of his snacks down within wesley's reach you had better believe that wesley will be dashing to it in seconds! sometimes owen doesn't even realize until it's too late. 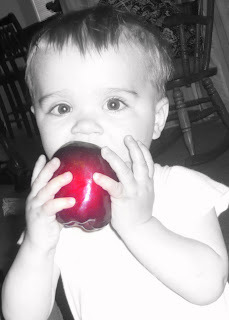 on friday wesley successfully snatched owen's big red apple. wesley is oh so very proud of this skill! happy birthday justin! we love you! 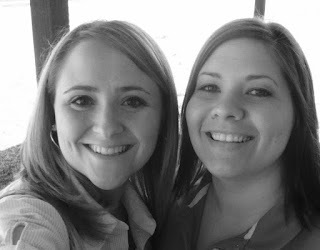 this weekend presented itself as the perfect opportunity to go and visit my friend steph at her new home in boise. kevin was busy working on his final project for school and steph's husband was back in oregon for the week. so, the boys and i planned a three day trip to play! and boy did we play...and eat...and shop! i love boise! i usually only see steph when she comes to idaho falls so it was so fun for me to visit her in her beautiful home and get a taste of her life. she keeps a well-run home and her kids are so well behaved. i came home with a lot of inspiration! thanks steph! owen just adores steph's daughter, joey. he had so much fun playing with her toys, flying kites with her and her big brothers (gage and cole), and digging in the dirt with her. these two were so cute when we went shopping! 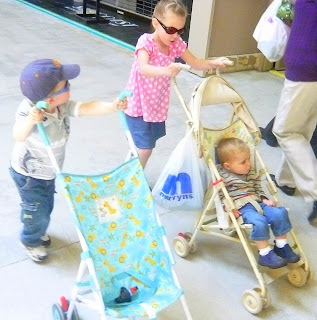 owen insisted on pushing his own stroller instead of riding in it. and the weather was so great for us! 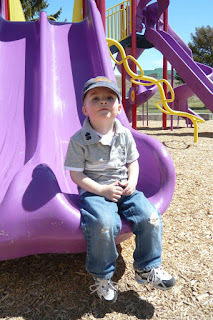 we played at a park during joey's soccer practice and wesley had so much fun in the bark. 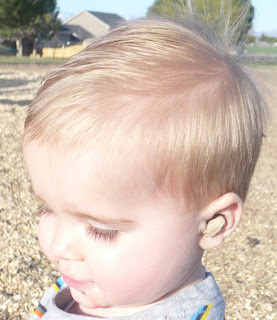 he was throwing it in every direction and actually managed to get a piece in his ear. such a funny little bug! we had such a fun time! i can't wait to go back. thanks steph! yesterday kevin had to spend the majority of the day in pocatello on campus so the boys and i decided to tag along. it was so much fun to get to play with my old neighbors. i miss them so much! after we had some lunch we all took a stroll down to a nearby park and played there for the afternoon. 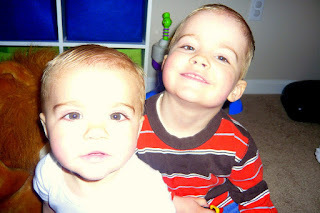 owen loved being with his buddy, kirk. they played so well together. owen playing on the slide. owen and kirk. they started playing together when they were little babies and now look how much they have grown! 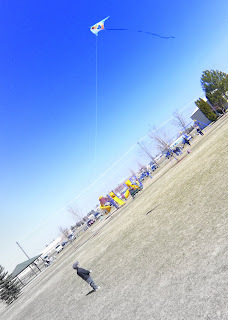 we had company staying with us this weekend (which makes these days even more fun) and so we decided to go to the park for some kite-flying, sliding, soccerball-kicking, fribee-throwing, swinging good times. 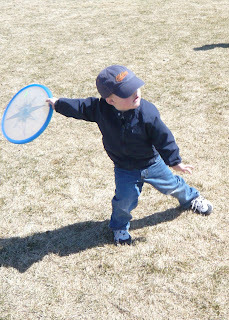 owen loved flying his kite...almost as much as the adults. 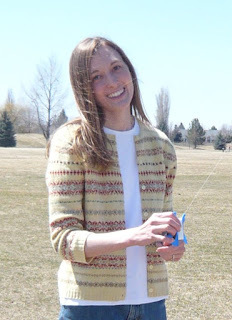 my cousin tressa taking a turn with the kite. 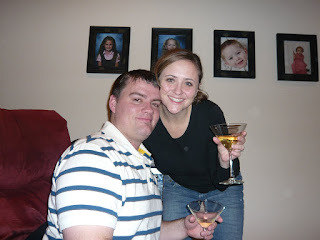 it was so fun having her and her husband spend a couple nights with us. tressa's other half...jake. 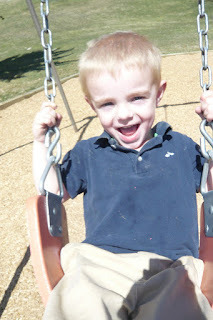 he was so great to play with owen and wesley all day. owen just loved having him around. 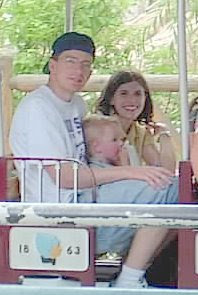 we had so much fun, and we all retired to bed that night sunburned and exhausted! LOVE IT! 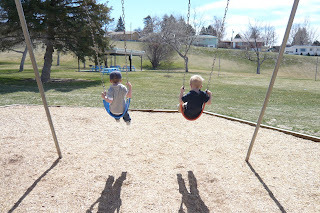 here are a few more pictures from our day at the park. 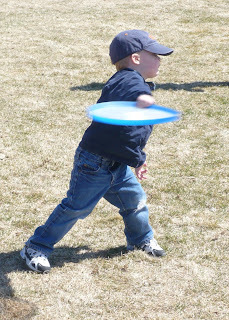 owen really enjoyed throwing the frisbee around. 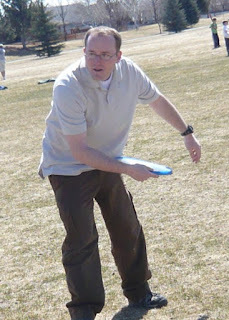 look at that form. he actually has a pretty good arm. 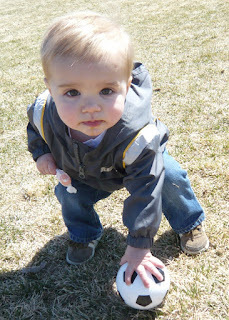 wesley with the two things he enjoyed most...taffy and his little soccer ball. 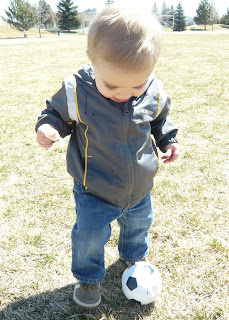 the last couple days wesley has been working on his dribble just for this occasion. 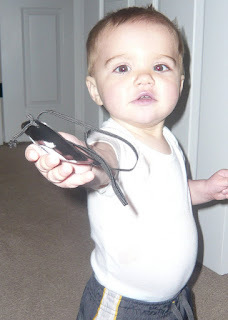 this week i decided to introduce wesley to a spoon. 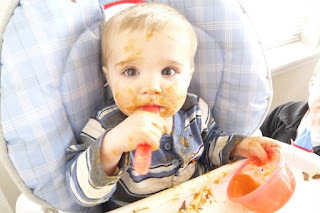 this kid will ONLY eat things he can put in his mouth by himself (and has been this way this he was 6 months old), but it has almost made me feel like he is missing out on the all good-for-you stuff that gerber has to offer. 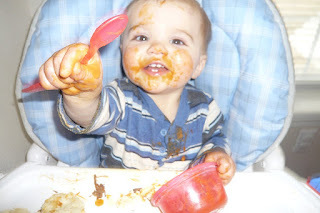 so i decided to give him a spoon and a little bowl of sweet potatoes hoping that some of it would make it into his little mouth. i don't know. do you suppose absorbing it through your skin counts for anything? today i had an aha moment as i was folding laundry. i was pondering all the different stories i had watched on t.v. this week. idol gives back, randy pausch, denise amber lee...and then i pondering my day-to-day life as a mom. 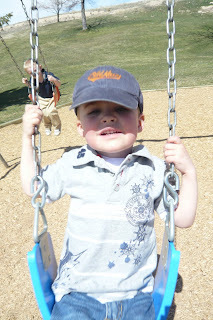 lately i was always feeling like my boys were begging for my attention and me feeling like i had more important things to do or feeling like i would rather do something i enjoyed more. why was i feeling this way? 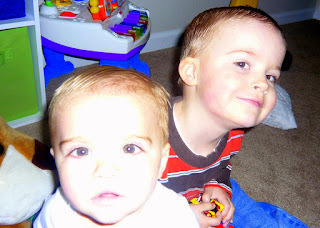 because when the boys were wanting to play i was being too selfish to walk away from the computer, or set the magazine down, or close the book, or turn off the television. so, i have decided that someone is trying to tell me something. set those things down! how you spend every day and every minute is important...especially when you have two little boys who want nothing more than to play with their mom. SO...all the "unimportant" things (but, me-time things that i enjoy doing) can just wait. they can wait until nap time or 9pm every night when my little boys are asleep and dreaming about all the fun they had that day with their mom and dad. life is WAY too short for regrets! so bring on the imaginary bears, story books, toy cars, and little people! so, this was my aha moment that i wanted to share (and remember). 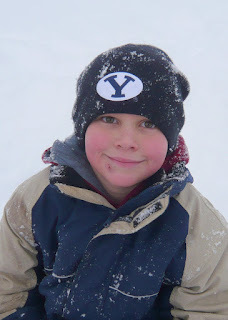 my nephew, payson, turns eight today! hooray! payson has the kindest heart and you will not find a boy with better sportsman's ship. 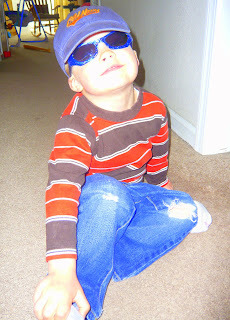 we love this kid! we hope you have a fun day today! i love when my birthday lands on a friday...so live it up! we look forward to coming to your baptism next month. love ya!